Ashtamangalyam is a set of eight items widely found in Hindu homes in Kerala. It symbolically represents auspiciousness and prosperity. Ashta means ‘eight’ and Mangalyam means ‘that which gives happiness’. Ashtamangalyam is not the eight miniature vessels but it can be any eight auspicious items. Ashtamangalyam was earlier associated with marriage. However, today miniature set of it is kept in homes as a decorative item. There is no one opinion regarding the eight items among scholars, pundits and priests. In reality, any eight auspicious items that are readily available can become Ashtamangalyam. However, today importance is given to objects (decorative piece) and not for the content. Again, the eight items vary depending on the auspicious occasion. The eight items are different for marriage; it is different for Vishu. All vessels are made using bronze. Traditional Nirapara and Niranazhi is made using wood and it is fastened using bronze belt. Cheppu – to hold kumkum or sandal paste. Depending on your spending power the design of the eight items gets elaborate. Thus we have designer mirrors, lamps in different shapes and sizes etc. The plate holding the eight items is not part of the set. 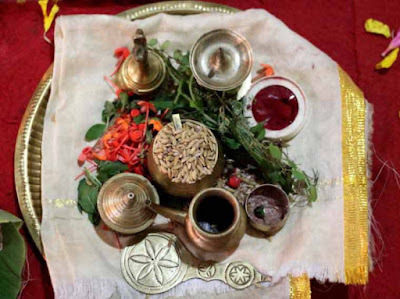 What items can be part of traditional Ashtamangalyam?